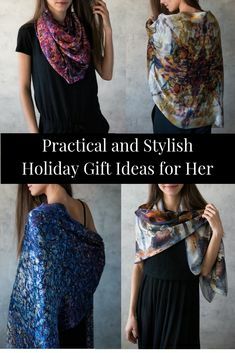 Unique, Practical and Stylish Christmas Gift Ideas for Women. It’s that season again! The Christmas lights everywhere, the chaotic movement of people in the shopping malls, the excitement building up as the Holiday season approaches, and the thoughts of all the presents for people we love and care for becoming overwhelming. I’ve put together a list of unique, practical and stylish Christmas gift Ideas for women (and some completely impractical but beautiful and stylish) to help you to make the choice of gifts fun and enjoyable experience. A lot of women, when asked about the preferred gift, would say that they’d want something practical. I’ve come up with several options for practical items of personal use that can reflect the personal style and be so-so beautiful. The phone has become our most used accessory, so wouldn’t it also be great if it reflected our personal style. If you are looking for a gift for someone who would appreciate a phone case that is a work of art, my choice here is the amazing illustrator Lilit Sarkisian. Her works are truly unique and are available on House of Botta for £29. For those of us on the go, a travel mug is a necessity not just something that would be nice to have. Especially, in this season when a sip of warm coffee or tea, could make the day. And of course, the water bottle is something very handy on warmer days so that we don’t have to deal with ugly plastic bottles and multiply the waste. There is so much choice out there, that it really comes to your individual taste to find the gift you need. I really love the slick design and colour choices of Eva Solo ‘To Go’ Cup available on John Lewis for £30 and Contigo Stainless Steel Travel Mug available on Amazon starting from £22 (prices depend on the colour option selected). When it comes to the water bottles, the most stylish choice for me are the ones by Kate Spade available on Amazon for £27.95. There are some Kate Spade cool travel mugs as well, but I just love the polka dot and the icy pink designs of the water bottles. Here I’m going to go a bit crazy. I probably have 5 or 6 notebooks in different sizes lying around at any point in time. This year I decided to treat myself to something beautiful and I’m going to get one of the Paperblanks notebooks. They’ve got design options for any tasted and different price options as well. Just look for them on Amazon. Honestly, I would buy them one after another if I could. If you want to take it one step further and are looking for a gift for a business lady or somebody driven by planning, career and personal goals, then check the planner options with more features below. All of them have beautiful designs and for some of them, you can even choose what goes inside. The first two have the most simple and minimalistic design. Leuchtturm 2019 Monthly Planner Notebook (£16.95) except having the usual monthly layout, has a lot of blank pages to put thoughts in a free format. Next, we come to some of the designs of Erin Condren planners. The planners are shipped from the US, but some designs like Metallic Painted Petals can be ordered from the UK Amazon (about £60 including delivery and taxes). Many more options available on Erin’s website. I had this planner for 2018 and this is one of the prettiest planners I’ve ever seen. The last but not least is another planner from the US and the Amazon’s choice for the planner of the year. The best thing about the Happy planner is that it’s fully customisable. A huge range of designs available (minimalistic, creative, girly and pretty), you can choose what goes inside and there are many extension options available. The list below is much less about practicality and more about style, beauty and sensuality. When it comes to the sense of silk on the skin or the eye-catching sparkle of the designer earrings, practicality becomes a redundant thing for most women. Out of all the jewellery, I have a thing for earrings. They add so much to your personal style. And also, you lose them often. At least, I do. So another pair of earrings can never be too much. Because it’s such a personal thing, you might think that giving earrings as a gift is not a great idea. But exactly for the same reason, they normally attract so much attention, that you can see what type of earrings the people close to you love. Here are some of my suggestions. (1) If you are looking for a gift for somebody special who loves turning heads when entering the room, I would suggest you look at Oscar de La Renta petal glass earrings. This is a pricey option, but it’s totally worth it for someone who puts the design over precious metals. There is a great selection of colours and some of them are available with a pretty discount on Outnet. (2) Shaun Leane is my first suggestion for everyday use to look stylish but not distract attention from your face and overall look. The prices start from £75 for the smaller ones suitable for wearing within strict professional dress code and go up to the skies for the fine jewellery. (3) Tory Burch is another one of my favourite designers whether it comes to jewellery or bags. There is a huge suggestion of stylish little earrings and statement earrings that could make the outfit. Prices start at £75. This one is one of my favourites. 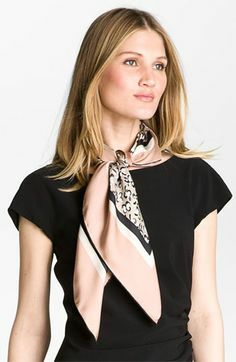 The silk scarf is a timeless accessory. It’s not only beautiful and able to tell a lot about the personal style of the owner but also can be a practical way to transform an office outfit for an evening out and make the same dress suitable for the office and for the theatre. We’ve got a variety of designs and sizes of silk scarfs available here at Aithne so that you can choose the one that is closer to your heart. And there is free worldwide delivery available on all orders over £100. 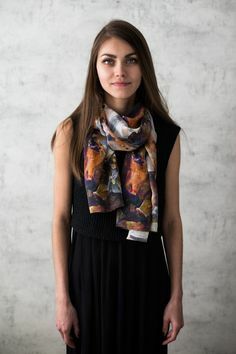 Square scarfs of different sizes could be great for both professional and casual attire. If not sure how to choose the right size of the square scarf, please check this blog post. 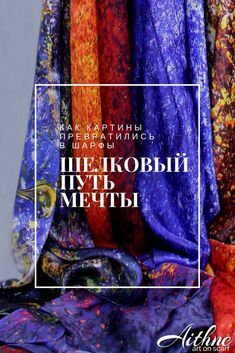 The long scarfs from the Vibrations of the Universe collection are great for somebody fascinated with the beauty of the Universe around and within us. Splash of colours and pure luxury. The long scarfs from the Oneiric World collection are great for somebody who would enjoy something different, a way of standing out from the crowd. Beautiful mix of colours and images inspired by the surrealistic world of dreams. And if not sure which one is the right scarf for your gift, then the Gift Card is the best choice allowing the person to make their own choice. So is there a better gift than an experience? When I started looking at what is available, I was just overwhelmed with all the different options that you can choose from whether it’s for your other half, mum, sister or just a girlfriend or colleague. Here is my selection of some unique options. Do you need to choose a present for someone with a secret dream of becoming a pastry chef or even just somebody who loves baking? Why not give them a chance to get closer to the dream with a Macaron cooking masterclass (£230) in Le Cordon Blue London? I don’t think there is a single woman (or man) that would not enjoy a relaxing day in the spa. On Buy a Gift there is a variety of choices whether you’d prefer a break in a luxury spa hotel in the beautiful countryside , a day in the spa in the town or just treat your loved one to a relaxing full body massage at the Ritz Spa before heading to a luxurious afternoon tea ceremony. Afternoon tea is another experience that you can’t go wrong with. Whether it’s a gift for your girlfriend, mum or the loved one, it’s a great way of enjoying delicious bites in a luxurious setting. The classic option is the traditional or champagne afternoon tea at the Ritz. If the gift is for someone who would enjoy the experience with a French twist, you can try afternoon tea at La Duree London. Would she love a breathtaking view of the City? Then the Aqua Shard Afternoon Tea might be a better option for her. And this one is my absolute favourite inviting the guests to the Wonderland. to enjoy tea with some Alice-twist. If you are invited to join for the Afternoon tea but not sure what to wear, please check this blog post for some outfit ideas for an afternoon tea in a luxurious setting. I hope you enjoyed going through these unique, stylish and beautiful gift ideas for women and were able to make some choices for gifts for your loved ones. If you loved this guide, please share it with friends who you think might find it useful. I always find the Christmas shopping so stressful and overwhelming with choices, that I’d love to make it easier for someone else. Disclaimer: The gift suggestions are based on my personal opinion and do not contain affiliate links to any third-party products.